For years, literally years, I’ve wondered why some wires have large balls attached. More often than not, I’ve come across balls on wires near water. Hence, I thought water had something to do with the reason for having the balls. (Perhaps, if the wire crashes to the ground, the balls keep the wire afloat and make for easier recovery?) I also thought the balls were used for planes. I posed the question to my new friend, Leonore, when we met for breakfast. Yes, I know the question is random, but there were balls on some wires near the diner where we ate. So, I seized the moment and took a chance that Leonore had an answer for me. Although she did not have a definite answer that moment, she did follow up with me via email that night. I’ve been sleeping soundly ever since. Oh. I’m sorry. 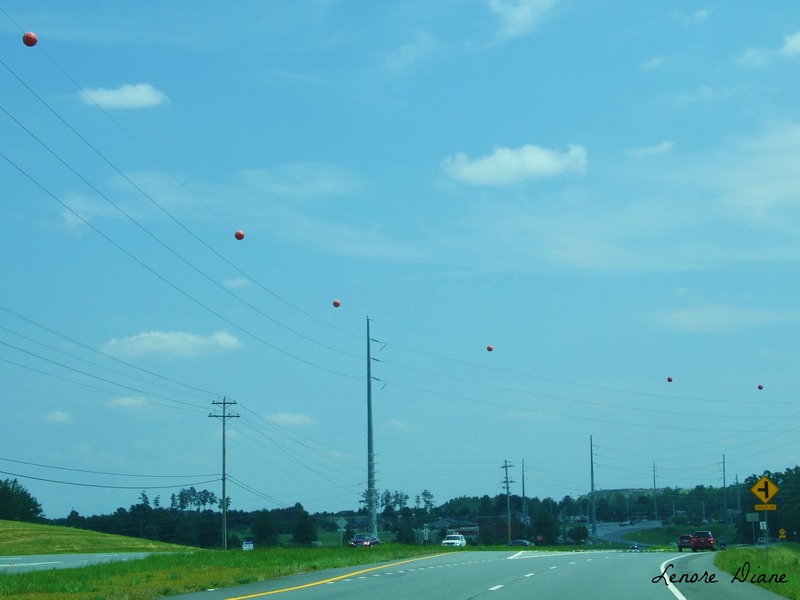 Did you want to know why there are balls on the wire? The balls on the wires are to make the wires more visible for airplanes. Balls have to be on wires within a certain radius of an airport. This picture was taken within the required radius of the Mathis Airport in Suwanee, GA. You’re welcome. Hold the phone. Someone else wrote about balls on wires? Really? Me hip? Wow. I need a moment. My “thoughts exactly”, Lenore. Thank you to you and Lenore for solving this mystery. It does sound like a military expression, doesn’t it? Funny. Roger that, Lisa. I am here to help. You are welcome, Jackie. I hope you sleep well from here on out. You are welcome, Patti. Your hubby is a smart man! I knew that! I knew that! As an aside, when I was a kid growing up in the city, we used to play a game called wireball. Do tell. How does one play the game of wireball? And Steve … next time, please share your knowledge. I do not like losing sleep. I would never leaving you hanging, LD. Wireball was sort of a baseball-like game — like stepball, but cooler. Two players stand on either side of the wires that go along the street. The “batter” stood in the alley and the “fielder” stood in the street. The batter throws a rubber ball up towards the wire. Hitting a wire was good — certain wires were singles, one was a homerun. The “fielder” had to catch the ball before it hit the ground (whether it hit a wire or not) for an out. Thank you, Steve. I am going to see about teaching the boys this game (or a version of it) this weekend. Well, I’ll be darned. I have never seen nor heard of these balls on wires. Great idea. giggle, giggle… I admit, I had fun playing with the title.